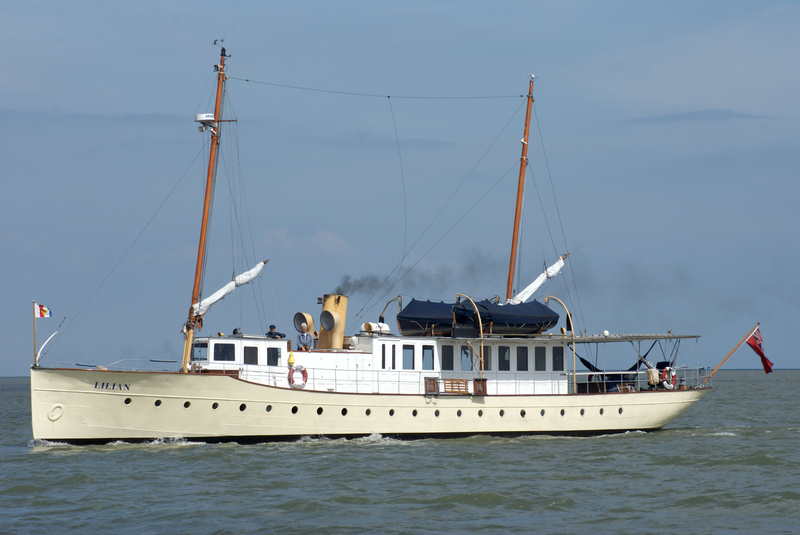 LILIAN is a rare survivor of the pleasure yacht tradition in the transition from steam to diesel. She was conceived and built in a country advanced in marine technology and is the largest surviving vessel designed by the iconic Swedish designer Carl Gustav Pettersson, better known for his later and smaller motorboats built in mahogany. This yacht set the tone for moderate scale yachts, is representative of a cusp in both ship and yacht design and is an early (and perhaps only intact and surviving) example of what was then a rare twin screw diesel yacht. LILIAN was powered by type Z Polar twin 6-cylinder diesel engines, each developing 75hp at 550rpm, built by AB Diesels Motorer and conceived by the pioneering diesel engine designer Jonas Hesselman. These engines included an early example of a successful mechanical reverse gear and their lightweight characteristics were reflected by Pettersson in the vessel’s design. As with other similar diesels, they were changed from blast injection to Bosch CAV injection in the mid-1940s. The original engines were removed in 1999 (port) and 2011 (starboard) and stored ashore. After an overhaul, both are in working order and could be returned to the hull, although LILIAN currently runs with modern diesels. The engine room includes the original vice, work bench, two of the tool cabinets, the wall compressor, lube oil tanks and day fuel tanks and most of the original flooring. There are an extensive set of original engine tools and some engine spares. Also of note are the electrics (110v DC, only some components of which survive and are not in use) and the 2-stage wall compressor, still installed in the engine room in working order. There is a high level of originality, with some essential reconstruction. Most of the below-water hull is still present, though covered by 5mm double-plating all round, done in 1982-3, with the external appearance of welding rather than rivets. Virtually all the deck and related fittings survive (ie capstans, railings, davits, anchor, etc), although the teak decks have been re-laid on steel (fore and side decks) or ply (stern deck). All but one of the vents are original, with the exception reconstructed in epoxy composite. The old portholes remain, but with glasses replaced. The boarding ladder has been reconstructed using the old iron-work. The deckhouse, wheelhouse and lazarette hatch appear as original, though subjected to some repairs with the deckhouse and wheelhouse now painted rather than varnished. The gunwales and exterior doors have been reconstructed to the original design. The propellers are new but one of the originals is stored ashore. The stern shafts, engine beds, steel diesel tanks and the copper water tank are original. The electrical system has been rewired but the original marble switchboard has been retained and is stored ashore. The original rudder, wheel and emergency tiller remain and gear levers are in place on the deck, though not currently connected. None of the original sailing rig survives: the current two masts were constructed following the designer’s drawings, but it was discovered later that the vessel had only one mast when built, so in this respect only the external appearance of the vessel differs from the original. The tenders are replicas built in 2000 to the original blueprints. Other adaptations include silencers, radar and navigational electronics, changing the ballast tanks to grey/black water tanks, the chain and cable to hydraulic steering, the addition of a hydraulic bow thruster, electric-powered winches to assist in raising the ships boats and hydraulics for raising the main (bower) anchor. The access to the forecastle has been made from the wheelhouse rather than from the foredeck. A watertight door has been cut into the previously-complete mid-ships bulkhead. Both of the main companionways and much of the original interior panelling, doors and floorboards survive, with some of the furniture (eg saloon table, chairs, cupboards and dresser), light fittings, dumb waiter, gun rack, but only one basin and head. Other surviving artefacts include a couple of glasses and monogrammed plates and the scoop ventilators. The most significance changes made in the last 35 years have reflected the accommodation needs of residential use, with installation of items such as 240v AC as well as 24v DC, washing machine and dryer, galley equipment such as electric cookers, and showers rather than salt baths. However, the priority has been to retain as much original material as possible at all times. Conservation to the engines has been done by Kew Bridge Engines to museum standards and work on the hull has been carried out sympathetically, but using modern steel, welding and paints. Repairs to the superstructure and interior have also been faithful, such as replicating damaged panelling with matching wood and using the original drawings as templates for areas where the original was too damaged to be resuscitated. The interior panelling remains polished, as original. There has been no attempt to recreate the layout of the forecastle. LILIAN has strong European associations, being designed and built in Sweden for a Danish owner, a well-known banker who led his bank to an infamous collapse. Her third owner was Rene Bollore, a French entrepreneur whose private company still survives, run by one of the richest men in France. In later life, LILIAN became a training ship in Windsor, where she enabled many sea cadets to be introduced to maritime life. The Geffrye Museum of the Home has recorded her use in the last 30 years as a residence. LILIAN has become a familiar attendee at classic boat rallies in the last 25 years. Registered in three countries and built in another, LILIAN’s significance is international, but she also has regional links to the tidal Thames were she has been based for 40 years, being on the non-tidal Thames for 40 years before that. An outline memorandum of understanding on the reciprocal navigation standards for European heritage ships was signed on board LILIAN in 2000 at Lambeth Pier outside the International Maritime Organisation. LILIAN is thought to be the oldest surviving diesel gentleman’s yacht worldwide and is rare on account of her original interior and in possessing her original engines. She is documented by a very substantial set of the designer’s drawings and blueprints, photographs from each stage in her history, including an iconic collection by J H Lartigue from the 1920s, log books since 1938, letters and personal testimonies since the 1940s. She has been recorded on the National Register of Historic Vessels since 2014. LILIAN was built to be aesthetically pleasing in her role as a gentleman’s yacht. Her light weight, compact engines allowed the hull form to have lower displacement and be more easily driven with fewer horsepower. Hence she reflects changing expectations of the appropriate visual appearance of a yacht, with a counter stern as is seen on the (earlier) steam vessels, but a straight rather than clipper bow, as seen in the emerging motor boats. With minor physical adaptations only, she retains her original hull form and many original features, remaining essentially unchanged to this day. LILIAN is kept in operational condition and is moored afloat at Twickenham on the Thames, in the area which has been her home for over 80 years. Source: Vessel owner, 12 January 2017. LILIAN was built as a gentleman's motor yacht by C G Pettersson, Stockholm, Sweden in 1916 and is a vessel of riveted steel construction. She was bought in a semi derelict condition by her current owners in 1980 and was substantially restored to sea-going use in 1988. Previously used as a mobile residential home since 1935 when she was first based in the UK, the vessel was acquired by the Windsor Sea Cadets in 1968.